Rarely do you ever see the front panels of the Live Action House. Only the living room section had a correct front. The indoors of the bedroom and kitchen do not match the layout on the other side. 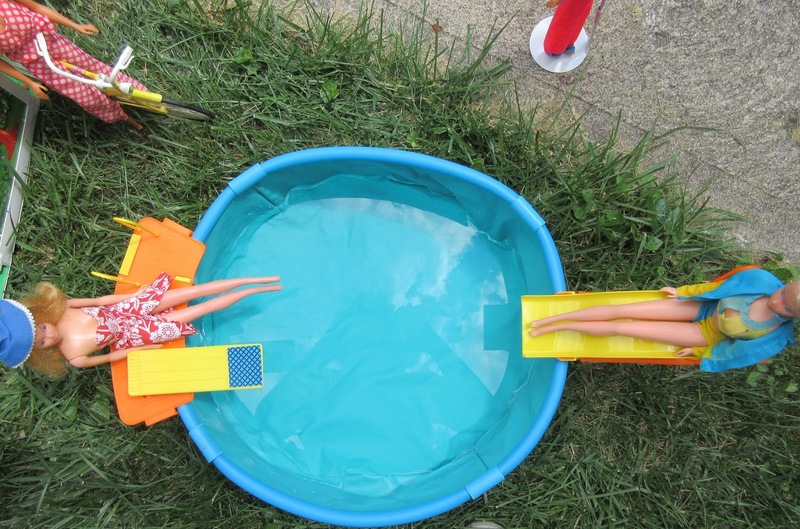 of Barbie's many swimming pools. 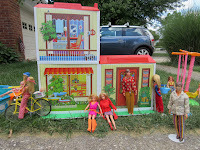 This is the end of my long-running project to photograph dolls, houses and playsets by decade in a street-like setting. Today it is for the 1970s. 2. Skipper's Swing-A-Rounder Gym from 1972. 3. 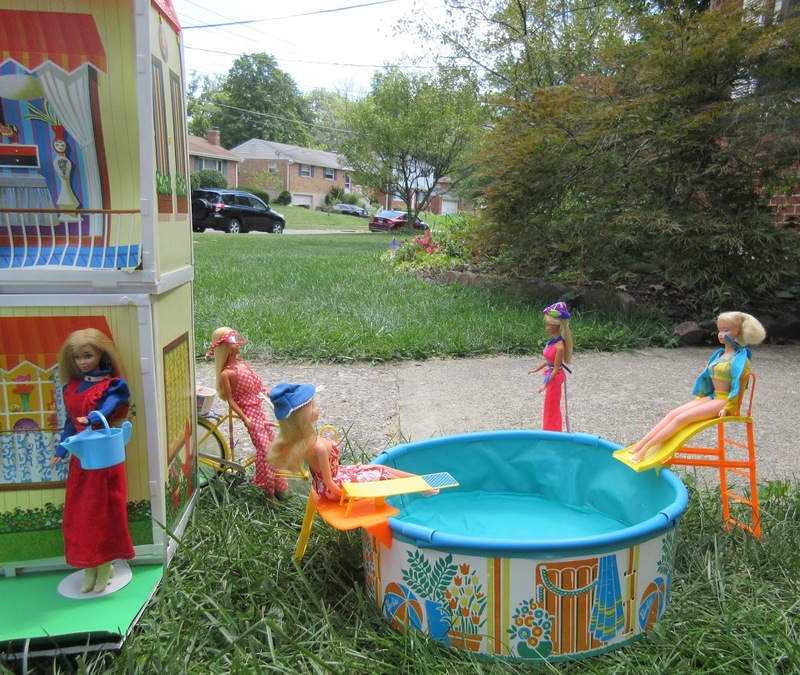 Barbie Garden Patio from 1973. Here is some information about the house. The exterior is yellow wood with red awnings (second version of the house, with different construction pieces). The interior has a bedroom and balcony with AstroTurf upstairs, a living room with a shuffleboard and pond outside, and a kitchen with a swing and more AstroTurf outside. The first version of the house, sold in 1970, was called the Lively Livin' House, and each piece was separate and took a while to put together. (I had this house as a girl, which is why I know this, but that house is long gone.) The Live Action House was the second version with some panels and connecting pieces combined, and could be put together much more quickly, but it is not as sturdy. (I purchased this as an adult collector.) 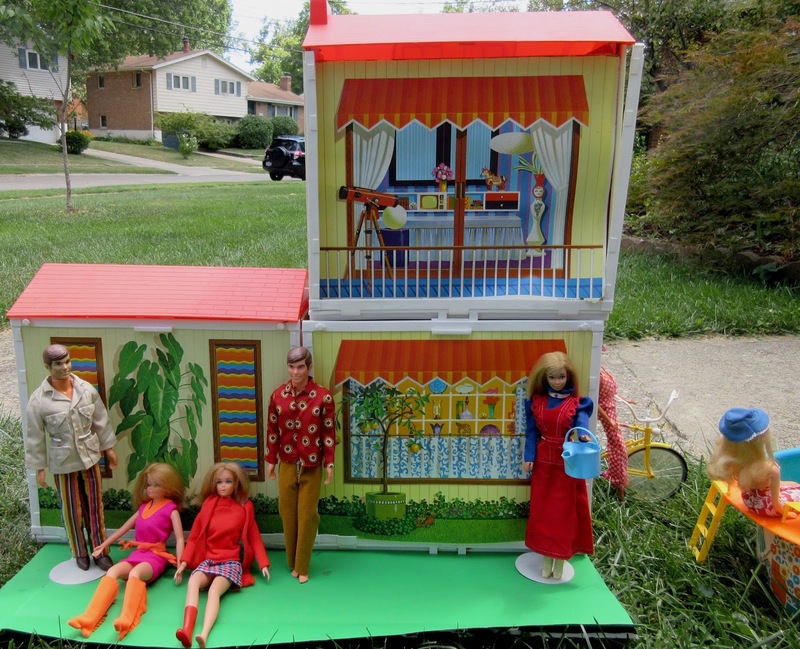 The third version, in 1973, was called Barbie's Surprise House and was the Live Action House plus some ivy seeds that could be planted to grow in small containers. The front panel to the living room is the only one correct. The back wall of the kitchen should actually be on the front wall. Neither the front wall of the bedroom or the kitchen show the interiors correctly. I'd love to be able to get several houses and completely rearrange the panels! The pool holds about four gallons of water and remains to this day the most realistic looking of all of Barbie's swimming pools. The garden patio wall was made of very thin molded plastic. My sister Barb had it and the wall cracked apart in numerous places. The accessories, though, would last a nuclear attack! I love the swing set. The regular swing, the teeter totter and the trapeze swing all look very realistic. You're supposed to be able to insert the thumbs of the Living and Pose N Play dolls into the slots on the seat of the trapeze swing to make the doll flip, but the thumbs do not stay in the holes. The funky spinner on the pole does not work either. You sit a doll on the sit and instead of following the swirl, the chair goes straight down. Thanks always to my sister Joan for letting me use her front yard and house. Even more rarely do you see the back of the Live Action house. 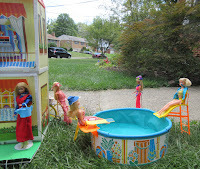 From left to right are Ken, PJ., P.J., Barbie against the house and Barbie on the pool deck. The pool holds up to four gallons of water. It would have taken up too much time to fill it entirely. Left to right are PJ, Barbie, PJ, PJ and Barbie. Here is the pool as seen from overhead. Obviously it's not big enough for swimming, much less diving!